Living on campus plays an important part of creating a solid foundation for your academic career. Students spend more time outside classrooms than in them, and it’s common to find students in study groups in all corners of their community. Some students choose to take advantage of our Living Learning Communities which are designed with Academic partners to serve students with coordinated curricular and co-curricular programs. You will have the opportunity to live with people of common interest and majors. Each Residence Hall has high speed wireless internet service throughout the entire building. Wireless internet access turns every lounge or dining hall into a convenient study space. All Residence Halls observe courtesy hours to create an environment conducive to studying at all times. Residence Hall staff members organize programs that enhance and develop necessary skills for academic success. 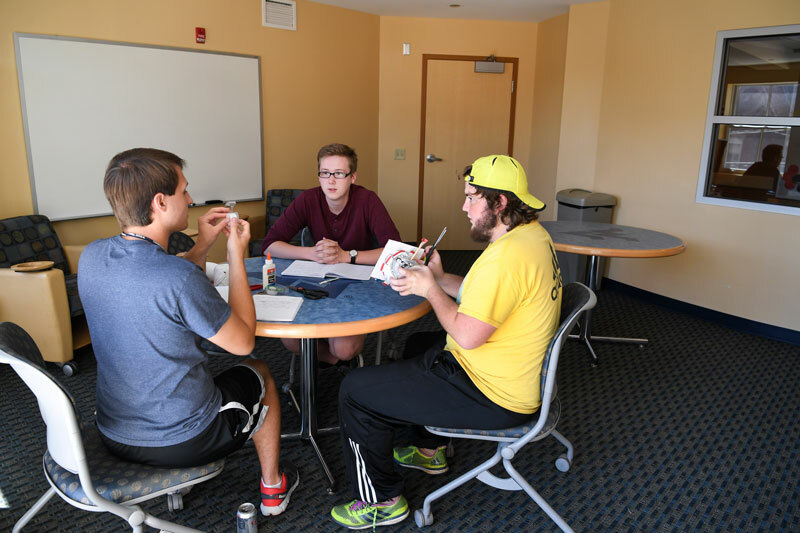 Beyond the study groups that get created by students during the semester in virtually every residence hall, resident students have access to structured and coordinated tutoring through the Office of Student Success, in the Evansdale Residential Complex, Evansdale Library and the Downtown Library.